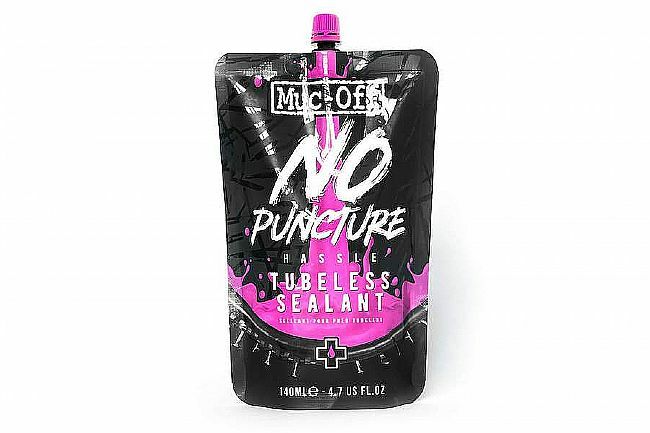 Muc-Off's No Puncture Hassle Tubeless Sealant 140ml Pouch seals tears and holes up to 6mm with the help of quick-acting microfibre molecules and advanced, long-lasting latex. With Muc-Off's UV detection system, you can easily identify any punctures missed by the naked eye. This sealant is non-corrosive, biodegradable, and easily washes off with water, making it easy to clean up afterward. Seals porous tires and bead/rim gaps. Lasts up to 6+ months. Suitable for 15-120psi and -20°C to +50°C. UV detection system (UV torch not included). Compatible with tubeless ready and full UST wheels/tires.